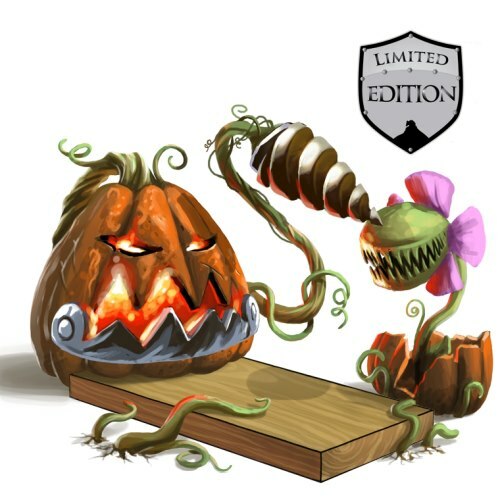 The Cackle Lantern Trap is a Limited Edition Shadow weapon upgraded from the Pumpkin Pummeler. Where did all the other pumpkins go? Oh yeah, that's right... the Cackle Lantern smashed them all. But, out of the remains of his old companions springs a new friend who understands the rigors of carnivorous planthood: a sprout of the Venus Mouse Trap. Together, these two are ready to smash, swallow, and snare any mouse that dares set foot on their trap-- just don't ask them to share the proceeds once they're done. The immense heat of the lantern occasionally increases Fire Salt drops when hunting in the Jungle of Dread. The Cackle Lantern Trap is a Limited Edition weapon and can no longer be acquired by Hunters. It can only be crafted given the proper ingredients. Digby DrillBot – source for Digby DrillBot Parts. Mutated Venus Mouse Trap – source for Venus Mouse Trap Husk. Obelisk of Incineration – source for Obelisk Parts. Obelisk of Slumber – source for Obelisk Parts. Pumpkin Pummeler – source for Smashed Pumpkin. Venus Mouse Trap – source for Venus Mouse Trap Husk. A complete list of Shadow weapons can be find here. Cackle Charm - When this charm is used in the Jungle of Dread, Fire Salt drops are increased. This effect stacks with the same effect generated by the Cackle Lantern Trap. 20 October 2010 : The Cackle Lantern Trap was first introduced with the opening of the Haunted Terrortories for the Halloween Trick AND Treat event.